I love Christmas picture books. I love sharing them with my children. Not only is it read aloud time which we are spending together but it's just extra jolly somehow. Love it. Every year I like looking for new books to share with the kids and this year I checked in with Barefoot Books to see if they had any titles to add to our collection. They kindly sent a few titles our direction to look into and both were enjoyed. The first was enjoyable and unique. 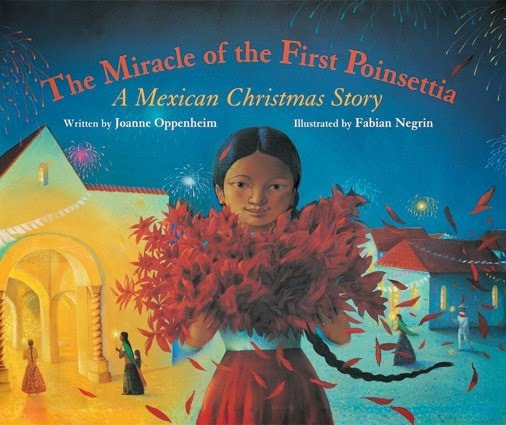 The Miracle of the First Poinsettia, by Joanne Oppenheim tells the story of a young girl named Juanita. It is the tradition in her village for the children to bring a gift for the Baby Jesus when they attend Mass together on Christmas Eve. There is only one problem: Juanita's family does not have enough money to spend on such a gift. Juanita frets about what she will take to give to the Baby Jesus. She is sad that she has nothing to offer. As she is standing outside the church building, an angel statute comes to live and tells her to take some of the branches from a weedy-looking plant by the door. Juanita picks some branches and carries them into the church where everyone is surprised and delighted by the beautiful red blooms which appear as she walks to the front of the church. This story is, of course, a fable. According to the author's note at the end of the book, this fable has been told many times and in many ways. Sometimes the story features a boy and other times a girl. Oppenheim decided to write the story surrounding a little girl. She also chose to both English and Spanish words and phrases when telling the story which can go either way for me. In the case of this book, I found the use of Spanish confusing in that a.) I don't know it and b.) sometimes you need to know it to catch the gist of what is going on in the story. At the back of the book you will also find a glossary which translates the words for you but you have to flip to the back page a lot while reading in order to follow along. Again, a mixture of languages in a story is somewhat hit or miss for me. The Miracle of the First Poinsettia is a lovely story and the kids enjoyed hearing it. However, it was sometimes confusing to them. Others might not consider that a problem at all but it does make for some disjointed reading to us and so I don't think we'll hang on to this book for keeps. Still, I find it beautifully told and illustrated enough to pass on the information about it. You might quite enjoy this title! 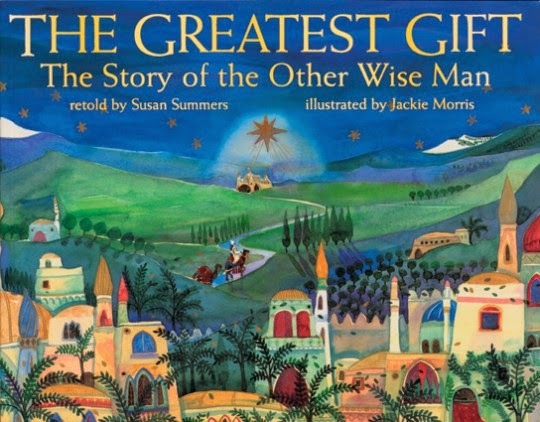 Secondly, Barefoot Books sent us a copy of The Greatest Gift: The Story of the Other Wise Man, retold by Susan Summers. In this version of the story we are introduced to Artaban, a fourth wise man and follower of the faith of Zooaster. He, along with the other three (more well-known) wise man study the stars to understand the struggle between the forces of good and evil. The four discover the famous star of Bethleham together and make a plan to travel to find the baby which they knew to have been born. The four decide on a meeting place and begin to make their travel arrangements. Artaban is trying to meet up with the other man to travel and follow the star but he has his travels interrupted by people in need. As a result, he never does find the One who is born under the star until it is "too late." Artaban never meets a baby, but he does meet a Savior. The illustrations by Jackie Morris are exquisitely beautiful. The story by Summer is compelling and interesting. I had Bookworm1 (age 8) read it first and share his opinion of it with me. He thought it was interesting enough to keep it and read it multiple times. As I quite agree with him, we shall do so. Without any hesitations, we recommend The Greatest Gift to others who are looking to add to their home Christmas collection. Many thanks to Barefoot Books who sent these titles our way in order to facilitate this review. I have received no additional compensation and all opinions shared are entirely my own. Please note: Barefoot Books sell their titles through individual reps. You can also order directly from their website. I've linked to Barefoot Books above and not to Amazon as a result. I did not know Barefoot Books sells through sales reps! Hmmmm. . .
You know I have a soft spot in my heart for Christmas picture books. The Fourth Wise Man book looks good! I'm reading The Other Wise Man now in a collection of Christmas stories. I had seen it in play form but had never read the original story. I imagine it makes for a lovely picture book.